Atlassian app ecosystem offers a lot of nice solutions to our daily challenges at work. Every quarter we share the list of our favorite new apps for Confluence, Jira, and Bitbucket that can help you stay productive. 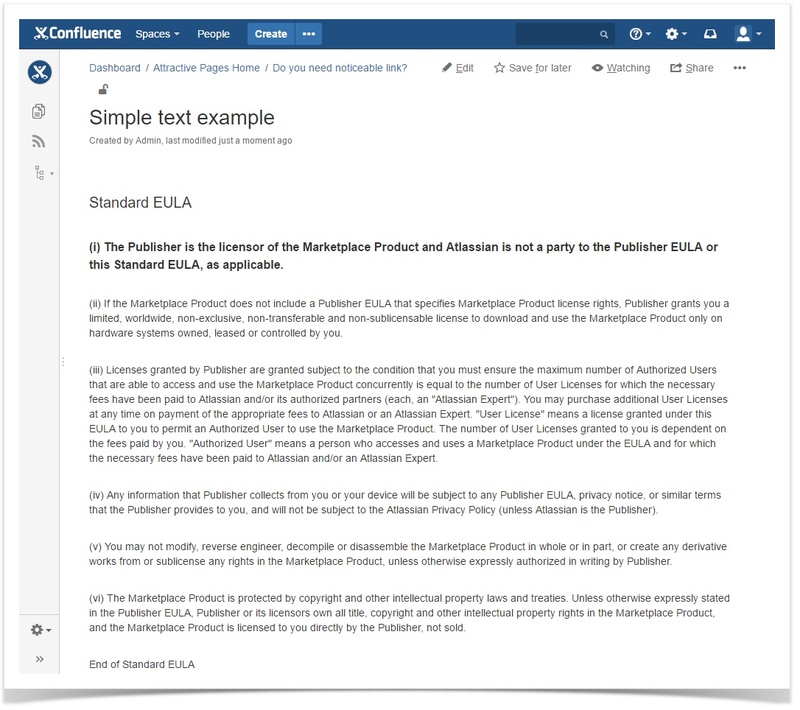 So we have reviewed all the newest Confluence add-ons appeared on the Atlassian Marketplace in the first quarter of 2018 and selected the ones that may help you power up your Confluence. Favorite Pages for Confluence Server by StiltSoft. Image Grid for Confluence Sever by FUCHSTEUFELS GbR. 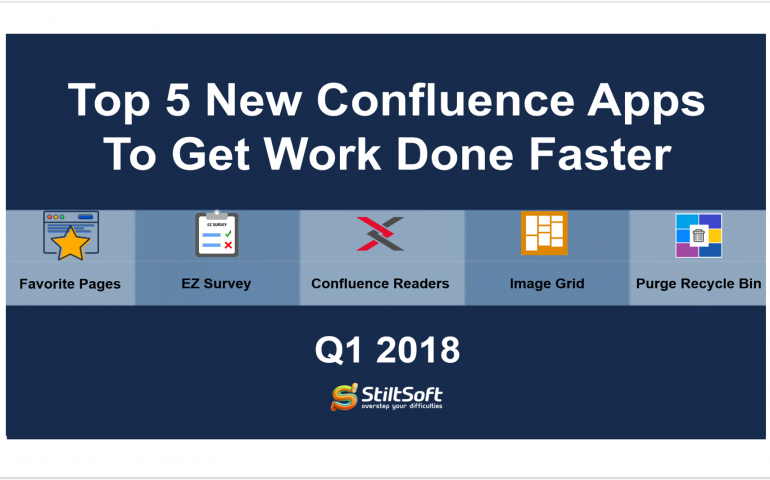 EZ Survey for Confluence Cloud by AppSentia. Confluence Readers for Confluence Server by MustHave Technology. Purge Recycle Bin for Confluence Server by scmenthusiast. Below is a list of these simple and useful solutions with a short description of what each one offers. Favorite Pages for Confluence provides you with a single list of your top-visited pages. It helps you quickly access any of the pages you have recently worked on, visited, or saved for later. You can lock any page by clicking the padlock icon or even assign a hotkey to the locked page to always have it at hand. Moreover, you can proceed to editing your saved for later pages in one click with no need to browse through spaces or look for the required page on the dashboard. This useful tool saves your time and effort when you need to quickly resume your work in Confluence. Pricing: The pricing for Favorite Pages for Confluence Server starts from $25 for 25 users and ends at $1,500 for the unlimited license. The Image Grid app helps you arrange your images in a visually appealing way. You just upload the required images and add the Image Grid macro to your Confluence page. There is no need to click the Insert button to add the images to the page. You can set the required image size that will be applied to all the images of the grid. When you change the width of your browser window or collapse the Confluence sidebar, the image grid automatically adapts to the page view. This simple tool helps you keep multiple images lined up and organized. Pricing: Image Grid for Confluence Server is free to use. You can use surveys to measure a variety of things in a workplace. EZ Survey allows you to easily create surveys that can be populated with different types of questions. 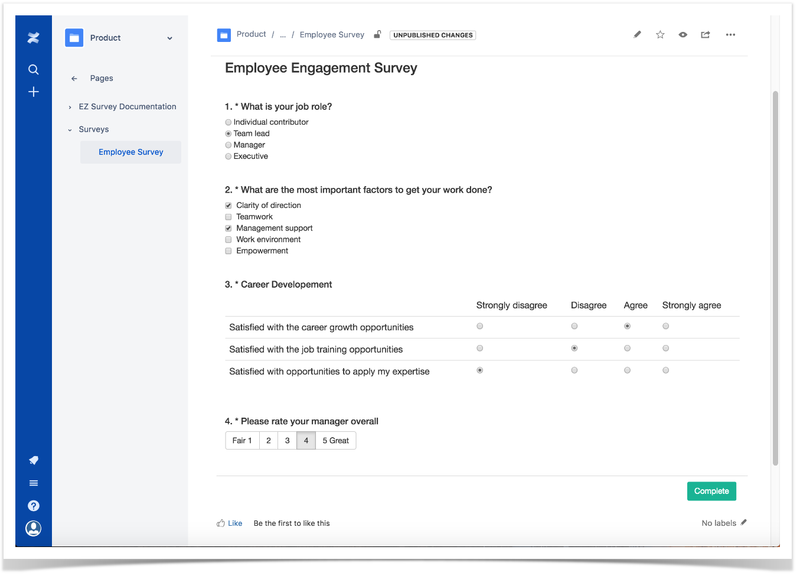 You just need to add the EZ Survey macro to the required Confluence page and create as many questions as you need. This solution helps you obtain crucial feedback from your colleagues to the benefit of your company and working environment. 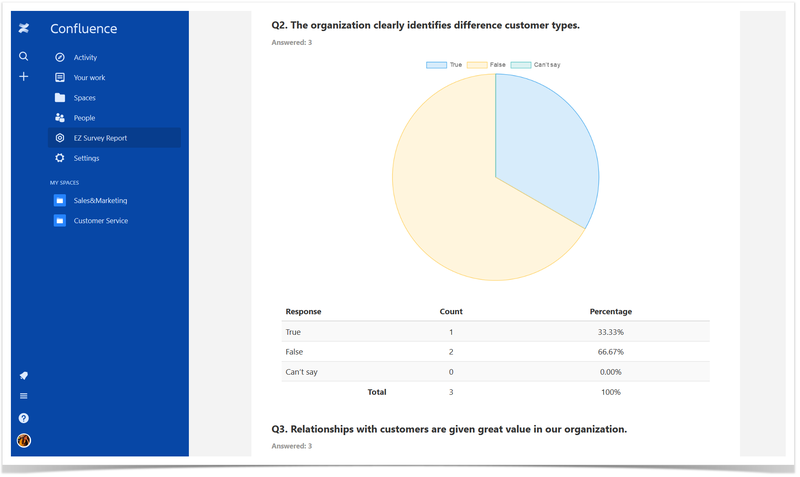 You can check the report that will show you the information about each question in your survey. The table shows the detailed information and the pie chart illustrates it. This add-on will help you to create surveys, polls, and votes right in Confluence. Pricing: The price for the EZ Survey app for Confluence Cloud starts at $5/mo for up to 10 users and ends at $445/mo for 2,000 users. 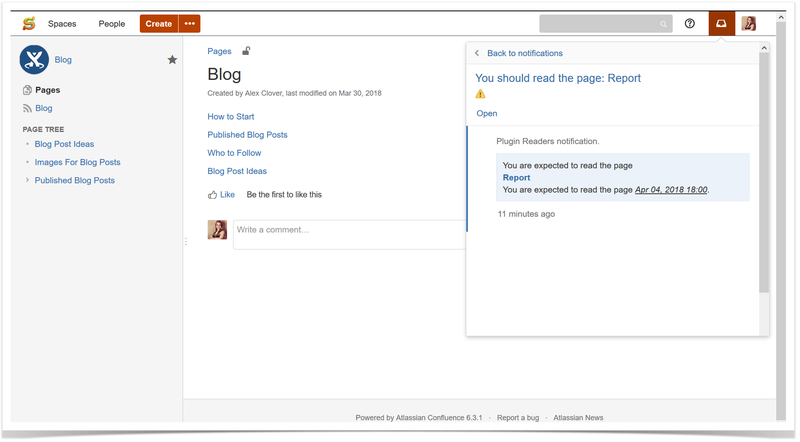 Confluence Readers is an app that helps you make sure that the recipients of your content get it and read it. After installation of this add-on, you will find a new tab called Readers in the menu of every Confluence page. You just need to select a certain user or a group of users, set the due date, and check the box Notify added users. The users from the list will receive the notifications not to miss this information. The good thing is that every recipient can see the due date. This way you can easily track the activity of the readers. You can add new requests to the existing list of readers. It can be a nice solution for sharing some time-sensitive information with your colleagues. Pricing: The pricing for Confluence Readers starts from $100 for 25 users and ends at $3,000 for the unlimited number of users. 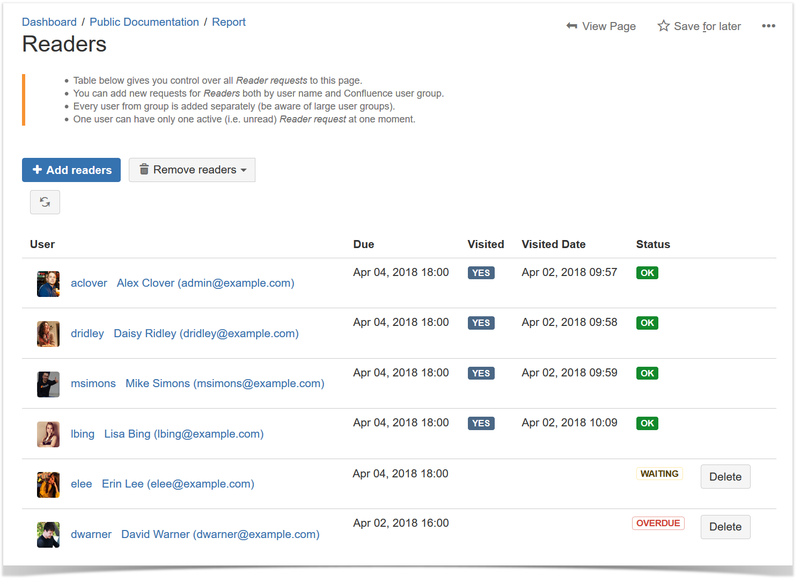 Purge Recycle Bin for Confluence is a simple solution that helps you automatically purge your recycle bin content keeping the Confluence database and attachments clean and compact. When you click the Configure button in the Manage add-ons section of this app, you can configure the purge retention period. This way the app sets the purge schedule. By default it is performed every Saturday at 3:00 AM. This tool allows you to avoid errors during XML export/import and helps you speed up the Confluence site. Pricing: Purge Recycle Bin for Confluence for Confluence Server is free to use. Give each one of these apps a fair trial and try them for free for a week or so, and see which one works for you and allows you to become more productive. If you have any questions, feel free to comment on this blog post below. Tell us more about your favorite Confluence apps.